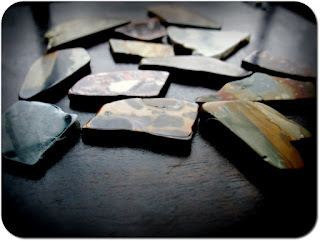 When I was a child, I spent hours and hours collecting rocks. Anywhere they could be found: the gravel driveway, the riverbed, treks through the pastures and running along the creeks. I alwa ys had my eyes open and ready to catch the first glimpse of the stones I was going to bring home with me and put into my red lunch pail that housed my precious collection. 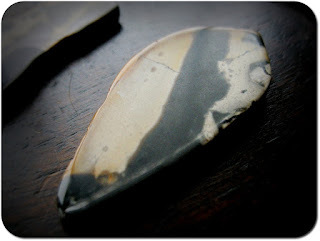 This year I met a man who is a lapidary artist, and the word is DEFINITELY artist. His work had me gazing at his setup for ages and ages. 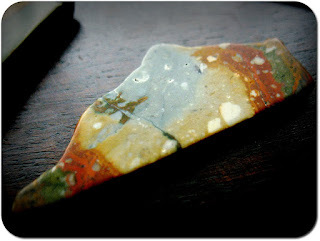 I didn’t take pictures of the finished stones that I bought from him, but they’ll soon be making their way onto this blog in future work. 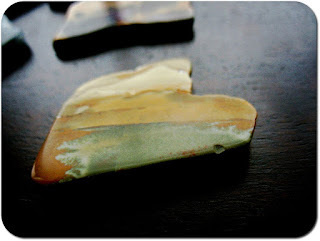 I do have pictures of some of the unfinished stones I got from him. I was fascinated and riveted to this area, shuffling through the bins to find the next hidden treasure. This one looks almost like a paisley print. These three look like they were once part of the same stone but became separated. The colors! A close up… Oh the colors! Living here in Newfoundland (actually nik-named "The Rock" in Canada and has some of the oldest rocks in the world!) 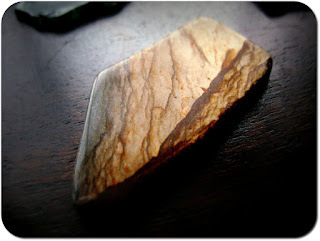 one learns to appreciate the exquisite beauty even the most banal rocks have. I was studying to become a Geologist "once upon a time" and it was a wonderful experience for me. 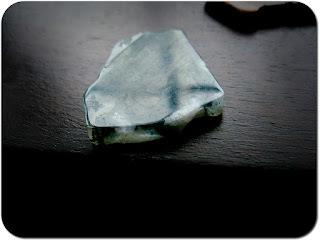 One of the best gifts I received this year were two little stones, from the local Geo Center, from my Mother. I am planing to use these in a few creations too. Thank you for sharing. 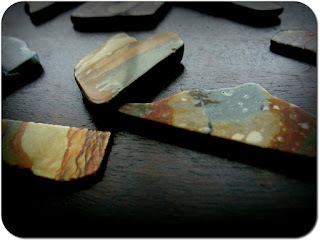 I love "unfinished" stones more than the beautiful finished ones! Thanks Andrea, your photos are awesome! 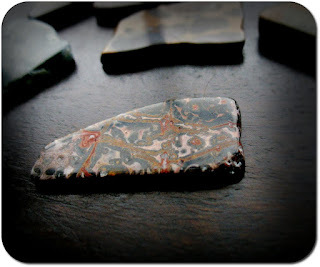 I love the patterns and colors that show up in some stones, it's amazing the way the pictures are formed in them.